What fascinates me to no end about the key operatives of the main opposition National Democratic Congress (NDC) is their scandalous belief that, somehow, they have a bounden obligation to impose extortionate economic measures on Ghanaian citizens, but that it is the unreserved obligation of the leaders of the ruling New Patriotic Party (NPP) to right such extortionate and economically destructive policies overnight. In other words, the leaders of the National Democratic Congress are like innocent babies who are incapable of any wrongdoing. It can be clearly seen that it was this warped and politically irresponsible mindset that prompted Mr. Mohammed-Mubarak Muntaka to call President Addo DankwaAkufo-Addo “a liar” on the august floor of our National Assembly. Mr. Muntaka is, of course, the Parliamentary Minority Chief Whip and the National Democratic Congress’ Member of Parliament for Kumasi-Asawase, in the Asante Region (See “Speaker Force(s) Muntaka to Withdraw ‘Akufo-Addo Deceived Ghanaians’ Comment” MyJoyOnline.com / Modernghana.com 2/15/18). The characteristically abrupt and snooty parliamentarian was, reportedly, contributing to a debate on the very progressive and constructive decision by the Akufo-Addo Administration to reduce the percentage of a petroleum tax imposed on Ghanaian citizens by the erstwhile Mahama-led regime of the National Democratic Congress. The imposition of the petroleum tax came about as a result of the foolhardy reliance on the country’s newly discovered oil wealth by the policymakers of the last government. Indeed, so bereft of vision and foresight that when these fiscal policymakers put together that regime’s 2015 budget, they had woefully failed to significantly take into account the volatility of pricing on the global petroleum market. If they had, they would, no doubt, have promptly recognized the imperative need to factor in some fiscally disciplined measures to take account of the vicissitudes of the petroleum market. Well, nobody really expected them to, since these faux Democratic Socialists had already made known of their intentions going into the Flagstaff House, that it was all about “creating, looting and sharing,” to borrow the evergreen words of Supreme Court’s Justice Jones M Dotse. In calling President Akufo-Addo a liar, Mr. Muntaka was drawing a rather facile and patently inconsequential attention to the fact that in the lead-up to the 2016 general election, then-Candidate Akufo-Addo had promised to scrap this nuisance tax imposition. As usual, what the Parliamentary Minority Chief Whip had conveniently failed to mention, let alone highlight, was the fact that Candidate Akufo-Addo made the promise attributed to him long before he came into full realization of the damning extent to which then-President John Dramani Mahama and Vice-President Kwesi BekoeAmissah-Arthur, the former Atta-Mills-appointed Governor of the Bank of Ghana, had literally run the country’s economy aground. 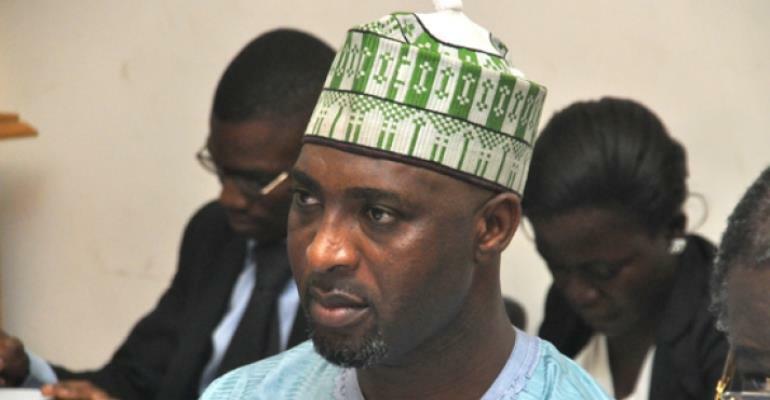 Mr. Muntaka had also conveniently failed to categorically state the fact that former President Mahama, under whose crisis-ridden tenure the Asawase NDC-MP had served as Sports Minister, had predicated his desire to be elected Commander-in-Chief of the Ghana Armed Forces, as far back as 2012, on his unwavering determination to have Mr. Alfred AgbesiWoyome, of Woyome Mega-Heist infamy, return the latter’s criminally extorted GHȻ 51.2 million loot to where it was originally stolen from, to wit, our National Treasury, with the equally criminal complicity of the movers-and-shakers of the National Democratic Congress, including the late President John Evans Atta-Mills. Now, with President Akufo-Addo’s appointment of the Independent Special Prosecutor, and on the verge of having the notorious NDC financier return his pelf, the NDC Parliamentary Minority have been pushing all the trick-triggering buttons to ensure that Mr. Martin Amidu never gets to bring the full-frontal-heft of justice to the “Shithole” doorsteps of the Mahama Posse. Indeed, even as I write, there is a nuisance lawsuit pending before the Supreme Court of Ghana, in which the plaintiff, Dr. Dominic Ayine, the former Deputy Attorney-General and NDC-MP for Bolgatanga-Central, is desperately seeking to have Mr. Amidu summarily disqualified from assuming his post as Independent Special Prosecutor, because the appointee just turned 66, barely a year above the statutorily stipulated retirement age of 65 years old for civil and public servants. But what is worth highlighting here is that if President Akufo-Addo has only been able to reduce the Mahama-imposed petroleum tax from 17.5-percent to 15-percent, and possibly to 13-perecent by the end of February 2018, it is primarily because Nana Akufo-Addo has had to shed billions of cedis, in hard currency, in the payment of arrears to road contractors, dating as far back as 2012, bequeathed his Administration by the pathologically profligate Mahama regime. In other words, rather than vacuously, and fatuously, accuse President Akufo-Addo of deceiving Ghanaians, Mr. Mubarak ought to be commending his undeserved target of abuse and vitriol for so rapidly and auspiciously repositioning Ghana on course for massive economic prosperity in the offing. Of course, Speaker Mike Oquaye also deserves to be commended for putting the insufferably obnoxious and culturally bankrupt Mr. Muntaka in his place. These “Spare-Tire Socialists” need to be promptly enrolled in a crash course on public- speaking decorum.